We have now entered Kagawa, the fourth and final prefecture on the island of Shikoku. On our long pilgrimage, Kagawa is the dōjō of Nirvana. This means that we have finished walking between all the temples in the dōjō of Enlightenment, which were located around Ehime prefecture, and now we are entering Nirvana. I would have said that those are symbolic terms that do not mean much, but during our visit today to temple 66, Unpenji – The Temple of Hovering Clouds, I literally felt for the first time on this pilgrimage, a real sense of Nirvana and bliss. But allow me to start from the beginning. Breakfast at the LiveMax hotel was a simple affair. It was a humble, self service buffet, but I was happy with my choices. I took some steamed rice, miso soup, a Hijiki seaweed salad, cooked Burdock root, Natto, pickles and a green tea. Jules just ate some rice and miso soup. It was very rainy, so we dressed in our rain pants and rain jackets, covered our backpacks and shoulder bags and walked towards temple 66. I used Google maps to locate a nice looking cafe about an hour or two into our walk, but I had no idea if the cafe was still in business or even open, but since it was on our route anyway, I decided to stop there. We walked on narrow paths between rice fields, to get there. It looked closed, but we walked to the front door anyway. It was a cool little rural cafe inside an old and well restored traditional farm house. We chose seats by the fire pit and ordered two blueberry tarts, cafe au lait and a hot Yuzu lemon tea. Outside the farmhouse, we could see the blueberry bushes that gave the cafe its name and its specialties. We considered asking them if we could leave our backpacks there, and collect them on our return walk towards Kanonji City, but we decided to give ourselves the freedom to return on another route and not to be obligated to return there. We continued walking towards the rope way that carries Temple visitors up the steepest slopes, but the road was not flat, it climbed steeply up through a farm area with orchards that smelled from strong fertilizers. I also think that we passed by a fertilizer chemical plant, because at times the smell was really bad. During our walk, we saw no other pilgrims, not walking pilgrims, not ones who drive cars and not a single bus full of pilgrims. Jules suggested that maybe the rope way was not operating today, and maybe we were walking a LONG way for nothing…. But I had faith in Japanese efficiency and said that if the rope way were closed, they would have posted some signs along the road, saving us from walking for many kilometers for nothing. Besides, we had passed by a bee keeper who was washing his waxed trays in a creek, and I stopped to chat with him. I told him that I love honey and he asked me where we were from and where we were going towards, since I had chosen to walk on small farm roads that were not part of the normal pilgrimage route. I told him that we were walking to Unpenji, and he asked if we were going to the rope way. I said that we were, and he pointed across the bridge and down the road towards a Shinto shrine. If the rope way was not operating, he would have told me. Locals always know everything through the grapevine. When we got to the rope way, Jules was very cheerful to see that it was operating. We rode up the gondola alone with a young Japanese woman in very high heels, who was supposed to talk about the elevation of the different peaks, the forests below us and to warn us when the gondola reached the top and bumped into location, but because she saw that we were foreigners, she decided that we would probably not understand anything she would say anyway, so she said nothing. The ride up felt like riding into a cloud. Nothing below us or around us was visible. It felt as if we were riding into a white tunnel of the unknown. At the top, we left our backpacks in the rope way shop. The temperature at the top was more than ten degrees Celsius lower, so we put on our rain coats that we had taken off on our walk, because we’d gotten overheated on our long climb up the road. 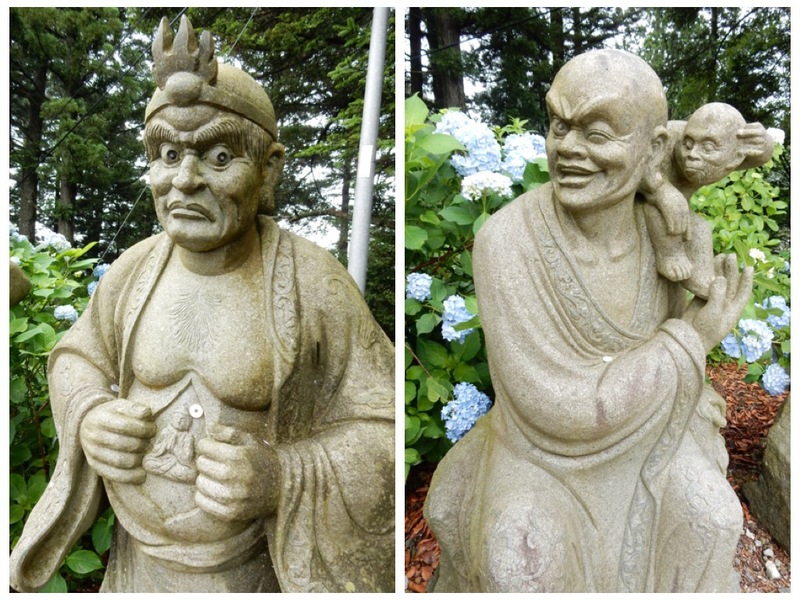 The grounds of the temple were dotted with HUNDREDS, and I do mean HUNDREDS of amazing sculptures of Buddhist deities and enlightened masters, all carved of stone. They stood in large groups, some standing on mythical lions, holding small monkeys, raccoons, dragons, elephants, flowers, snakes or mythical birds. The mist covered the tall ancient trees that surrounded the sculptures, and they were so full of spirit, that I could hear them talking to me, as I roamed around them alone and full of bliss. I wanted to photograph all of them, one by one, so I could use them in the future as inspiration for my paintings. I started photographing one by one but as I turned the next corner, there was another hill with about a hundred more standing below me. And then a hundred more farther down the path, each with his own facial expression and unique posture. I knew that I would have no time to photograph more than about one hundred of those five hundred life size masters. I asked Jules to go and find the Nokyosho office, to stamp our pilgrim book so I could wander around the forest and be with the masters some more. buildings, altars, sculptures, bells all emerged and receded from view. It was a magical time in a magical place, worth the entire Shikoku pilgrimage just to experience. As I walked among them, I found myself talking to them, asking them questions and hearing their answers to me. During her installation, she sat in a chair and people visiting the museum came to sit in front of her. She did not say a word, just sat there being attentive and very present. The waiting list of people who signed up to sit in front of her was humongous. People were standing in lines for blocks outside of MOMA. Many people cried as they sat in silence in front of her. Today, as I roamed in the mist among those masters, I stood in front of many of them and looked into their eyes. I then paid attention to what thoughts and feeling arose inside of me. I was AMAZED at the insights and wisdoms, emotions and vibrations that I felt. One of the masters was holding a small dragon. How do I do it?…. Other masters talked to me about courage, determination, being patient, strong, gentle, loving, quiet, content, free, powerful, forgiving…. No one else was around as I walked among those amazing stone teachers. Just the old trees, the flowering hydrangeas surrounded in a thick mist…. I did not want to leave…. Somehow, Jules found me and it had started to rain harder. We deposited our Osamafudas in the temple’s main hall and Daishi hall, chanted the heart sutra and reluctantly made our way to the rope way. We still had about three hours of walking to do in the rain, before we reached our hotel for the next three nights. We made our way down the hills and into the flat area. The city still felt rural, not very built up, as there were no high rise buildings on the horizon. We walked in the rain for over two hours. Our feet hurt and we mentioned to one another that we had gotten used to walking without our backpacks, and how much harder it is to walk all day long with those extra pounds on our backs. It occurred to me that we must not be walking on the best road into town, since we had passed by no shops and no places to eat. I checked on Google maps to see if there were any cafes along the way, and found one a few blocks away. It turned out to be a charming place. The owner of the cafe invited us in with much warmth. We were dripping rain all over his clean cafe. He made us two delicious iced coffees each and a big toast to share. He told us that he had walked the Shikoku pilgrimage himself, and when it was time to pay the bill, he refused our money and said that everything we had drunk and eaten was his gift (Osettai) to us. We insisted on paying but he only took money for two iced coffees, giving us the other two and the toast for free. He even left the cafe and walked us out when we left, waving goodbye to us. What a kind and wonderful man. We felt more rested after our food and coffee break at his cafe. The last four kilometers walk felt a bit easier on our feet. Our hotel, the Kanonji Grand Hotel, is not so grand. The front desk was surprised to find out that we’ve booked three nights. It is usually a place that business people move through. We’ve booked three nights, because we plan to walk to all the temples in this area without our backpacks, and then walk out of town when we are done. We knew that today’s walk to visit Unpenji temple and back into town, was a long walk and we would have no time to walk the extra ten kilometers to reach temple 67, Daikoji, before they close at five in the afternoon. So we will visit Daikoji, temple 67 and temples, 68, 69 and 70, and even continue walking farther, towards temple 71, in order to give ourselves an easier day on the day we leave town. We had dinner at the hotel’s restaurant. All the other guests were business people, dressed in dark suits on business meetings. They bowed to each other multiple times. It was lovely and respectful. The hotel has Wifi only on the first floor. After dinner and a good shower, we sat on the old chairs by the vending machines and did some research online. Unpenji is also known for its eggplant-shaped stone seat on which I sat. It is said that any prayers made while sitting on it, will be granted. We shall wait and see…..
Kōbō Daishi enshrined here a Buddhist relic in the year 790, and then returned at a later date, founded the temple, and carved the main deity. Emperor Kameyama (years 1249 – 1305, the 90th emperor of Japan), came here and planted a Ginko tree which bears a Sanskrit inscription. In the late 16th century, a Samurai from a clan in Kochi/Tossa province named Chōsokabe Motochika, climbed to the temple and was so inspired by the grandeur, that he decided to try to conquer the three other Shikoku provinces of Awa, Iyo, and Sanuki. The temple priest tried to talk him out of it and, even though Chōsokabe refused to listen, the priest’s forthrightness and willingness to speak his mind, may have been the reason that the temple complex wasn’t burned down like so many others on the island. This temple is located at the highest elevation of all the pilgrimage temples. I am so excited for you! . It will change your life for the better and give you so many insights. Please share your journey when and if you can.